Gordon Platt In the biggest offering of high-yield debt in the US market since July 2003, Intelsat Bermuda sold $2.55 billion of notes in a three-part private placement. The global satellite operator is being taken over in a $3 billion leveraged buyout by a group of private-equity firms. The debt offering was delayed for a month due to a malfunction of one of the company’s satellites, known as Americas-7. The company provides satellite communications services in more than 200 countries. The sale included $1 billion of seven-year floating-rate notes, $875 million of eight-year senior notes, and $675 million of 10-year senior notes. 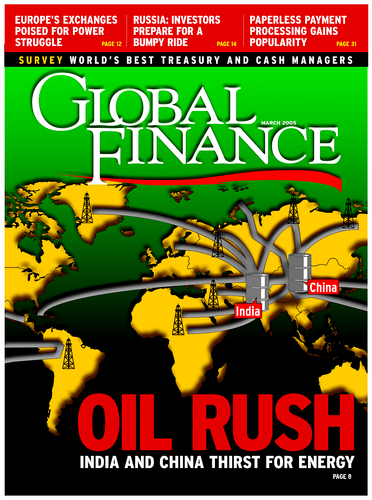 Deutsche Bank, Credit Suisse First Boston and Lehman Brothers were the joint lead managers. Just three weeks after the January 24 note sale, Intelsat’s Zeus subsidiary raised $305 million through the sale of 10-year senior discount notes to fund the repurchase of preferred stock held by Intelsat’s equity sponsor. 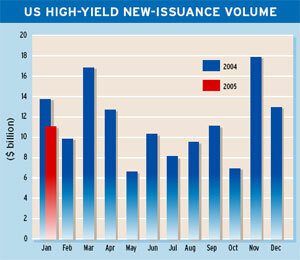 Total US issuance of high-yield corporate debt fell to about $11 billion in January, from $13 billion in December 2004 and $18 billion in November 2004, according to KDP Investment Advisors, based in Montpelier, Vermont. The biggest individual issue in January was the private placement of $1.4 billion of senior notes by Novelis, the world’s largest maker of aluminum rolled products, as well as the biggest recycler of aluminum beverage cans. Novelis, which was spun off as an independent company by Montreal-based Alcan in January, says proceeds from the offering will be used to repay debt issued to its former parent. Alcan, a global leader in aluminum and packaging, has 73,000 employees and operating facilities in 56 countries. It says the spin-off of Novelis will achieve the separation of competing businesses that Alcan agreed to in order to obtain antitrust approvals for its acquisition last year of French aluminum produce Pechiney. Novelis, with annual revenue of $6 billion, has 37 operating facilities in 12 countries and more than 13,500 employees. The International Finance Corporation, the private lending arm of the World Bank, sold $117 million equivalent of seven-year bonds denominated in Moroccan dirhams in February, paving the way for more bond issues in Casablanca. The IFC sale was the first bond offering by an international institution denominated in dirhams and the first domestic bond offering by a supranational in Africa and the Middle East. The market in which domestic bonds are issued by foreign entities in Morocco will be known as the Atlas market. 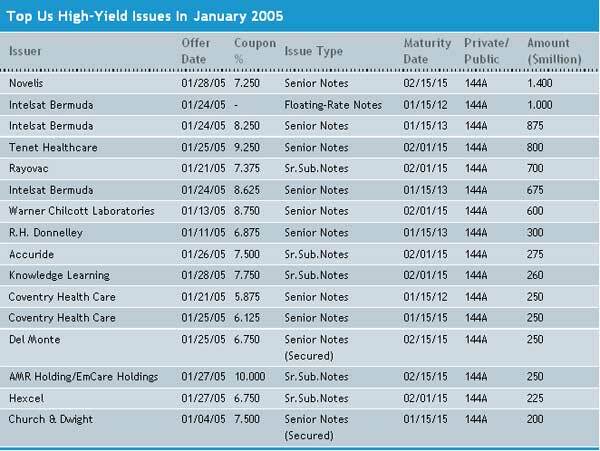 The bonds, which carry a coupon of 4.54%, were sold to more than 20 institutional investors. The lead manager was Banque Marocaine pour le Commerce et l’Industrie. The co-lead managers were Attijariwafa Bank and Caisse de Depot et de Gestion.